i’ve actually had projects to work on without much time to proper doodle. 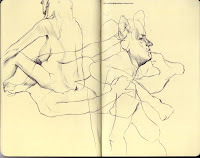 the bulk of what i’ve drawn lately have occurred on the subway or at life drawing sessions. here’s another session at ocad. I’m impressed with how much information you can get down in a short period of time–and how sensitive your lines are. Nice sketches!